Condoms. An essential supply for a chase vehicle. Today’s blog post is by a contributing author. Joe will be writing this post. I gave him free rein to write whatever he wanted to on this subject. New Tricks for an old dog! I have resisted my beautiful brides attempts at writing a blog. Until now, that is. This is a subject I just couldn’t pass up. Well, shall we begin this journey down memory lane. When I was a kid (really long ago) my family would set around the dinner table, especially at Thanksgiving and Christmas, and talk about the “good old times”. These conversations ran the gamut from my grandpa’s secret weapon, only used at harvest time, to the World War that was just passed. At the time it was known as the World War. The Second was only added some time later (I don’t know when that happened). Some of the things that were talked about became items that were very useful to me in later years. Grandpa’s secret weapon was, of course, my grandma. Grandpa had a very large and deep ice house. You must remember at the beginning of the last century (1900) there were no home ice making machines. Some of grandpa’s neighbors laughed at his large ice house, saying that he sure wasted a lot of time digging such a large one and that it took such a long and arduous time to fill it. There was madness to his scheme, which I was told, that none of his close neighbors ever figured out. To fill the ice house you had to wait until the local stream froze over to a good depth, usually about six to eight inches or more. You went to it with an ice auger, ice saw, and ice tongs. You drilled a starting hole with the ice auger and then proceeded to cut the ice into large chunks and remove them to a small wagon. When the wagon was full you took it to the ice house and packed the pieces in with a large amount of wheat straw that had been saved from the wheat harvest to insulate each of them. When the ice house was full it was kept full till spring (which was just around the corner) by adding more ice as some was used until the stream was no longer frozen thick enough to walk on. This ice, from such a large ice house, was usually available most of the year. At harvest time grandpa always had the pick of the hired field hands to help him. Usually by harvest time all of the other farmers in the area were well into their ice storage and would only use it for their own needs. Grandma always seemed to have an endless supply of ICED TEA for the field hands in the hot summer weather as well as the best vittles served to the field hands in the area. Hence grandpa always calling her his “secret weapon”. He had the pick of the best field hands because of her and her ICED TEA. Thank you very much for “too large” of an ice house. All you business owners today should keep this lesson close. It might make a big difference in the bottom line. You think maybe happy workers are the best? When I started doing this job I pulled my pickup behind the truck or trucks. In doing so I had to have some way of disconnecting the differential from the transmission. 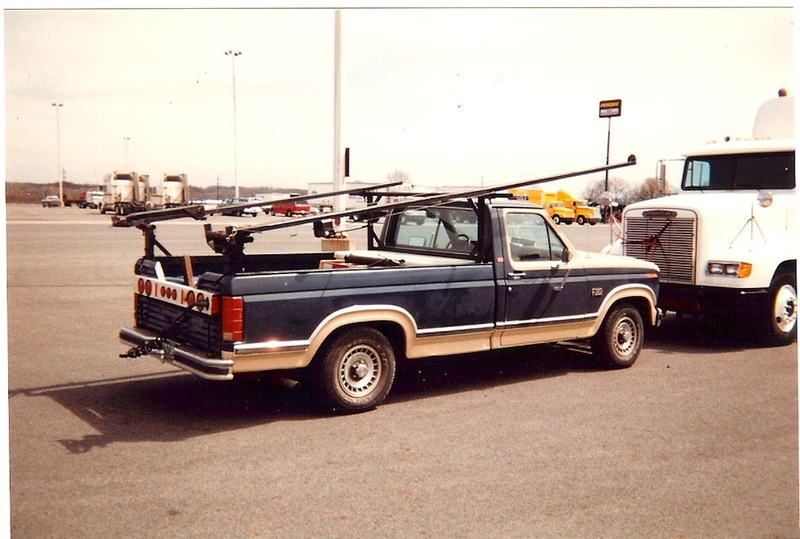 My first tow vehicle was our 1985 Ford F250 Diesel pickup. This truck had a manual transfer case that could be set into neutral and the truck could be towed forever. The reason behind this is the fact that the transmission has no internal lubrication when only the rear shaft is turning, like when the truck is put into neutral and allowed to move in some manner. If you pull the vehicle while it is in neutral you will destroy the transmission, from the rear, by having the differential turn the rear shaft of the transmission without any lubrication, thereby ruining the bearings on the shaft. I pulled my first 1971 Ford F100 pickup, which had a three speed column shift, in neutral and destroyed the transmission, so I am speaking from first hand experience. The transfer case in my 85 had a rear pump and it would lubricate the gears in the transfer case just fine. When the engine blew up I had to find another tow vehicle. Enter our “new” truck Gracie. She is a 1986 Ford F150 pickup with a C6 automatic transmission just like the 85 but, without the transfer case. What to do? Well at that time the answer was to simply “pull the drive line” thereby removing the connection from the transmission to the differential. This was accomplished by crawling under the pickup, removing the “U bolts” holding the “U” joint to the differential. You then have to tie the drive line up out of the way and keep it from hitting the ground while you are moving down the road. The only problem with this is the fact that the drive line is under the truck secured up and bouncing down the road. My “U joint” is only similar to the one in the picture as mine was held on with “U” bolts. Once the “U” bolts were removed you had to secure the bearing caps on the cross of the “U” joint. If this was not done well you could loose a cap or two and then have a real problem. I used several methods to keep the caps in place but, they all have some type of a problem in the end. So! Answer! Remove the whole drive line. This is accomplished by pulling it off the splined shaft on the end of the carrier bearing. I could then put the drive line in the back of the pickup bed and keep it secure and clean for the next job. See the pic below. As always with a solution comes new problems. When it came time to replace the drive line and go to the next job I had to clean out the splines before I put the shaft back on. The splines usually had grease on them and would attract and keep all sorts of nasty things that would not be good for the shaft when it was reinstalled. After doing this several times I thought I had to find a better way to do this job. I was laying on the wet roadway when I had a flashback. Sometimes my mind jumps from one picture to another, to another, and yet to another so fast that I will be in another world in less time than it takes me to blink. Just ask my beautiful bride about how my mind can jump in a conversation from talking about flowers to sitting in a train car in Central America in less than a second, sometimes leaving her wondering where I went. Now to the condoms. During the World War our troops were issued PK Rations or some form of field rations. These usually included; a meal (misnomer, if ever there was one), pack of cigarettes, fire starter of some sort, other items I can’t remember, and a pack of condoms. After looking at the films that were prepared for the troops about STD’s you wonder why even bother but, our leaders know best. The stories went that the condoms were best used for keeping water and dirt out of their rifle barrels. Unroll the condom over the end of the gun and when you had to pull the trigger you knew the gun would work as advertised. This worked well when we went hunting in the winter time. Crossing small creeks, fences, and other impediments were hard to do with getting something on or in your gun. Condoms worked well for keeping the barrel free from debris. FLASH! Why wouldn’t this work on the splined shaft? Answer: It works well. Just unroll it over the spline and when you get to where you are going take it off and put on the shaft. Bingo. Job done. After removing and installing the drive line more times than I would like to remember, I stumbled upon a driver who had a REMCO Quick Disconnect installed on his tow vehicle. He just had to reach under and slide a coupling in place and his drive line was back in operation. I had to have one of these. I looked up Remco in Omaha, Nebraska, and went to their shop and purchased one of their kits, including the “from the cab” operation device. This item worked for some time. Remember from above: As always with a solution comes new problems. We had some problems with it and the factory replaced it three times. One of the problems happened in Baltimore, Maryland, but that is for another post from my beautiful bride. She will tell you how she learned to “fire truck” our setup as well but, that’s for another time. Until then, “Be well and do good things.” Oneablefox said that. Where were you on December 31, 1999? 1999 was a crazy year. There were rumors of total devastation and ruin. The electric grid would fail and everyone worldwide would be out of power. Water supplies would be contaminated because all the pump stations would be shut down from the power loss. Filling stations would not be able to sell gas or diesel because of the power outage. Banks would close their doors because there would be no money or no way of knowing how much money anyone had in their bank accounts. Computers were going to all stop working come January 1, 2000. Cell phones and telephones would all be down and no one would be able to call for help. Police would be overwhelmed with trying to manage the weirded out population. Hospitals would stay open as long as they could using their generators until they, too, shut down. There were stories everywhere of people stocking up on bottled water and canned foods. Some grocery stores were nearly left empty from the deluge of shoppers preparing to live a life similar to the movies of Mad Max and other apocalyptic movies depicting life after a major catastrophe. Gun sales went up late summer and far into December. People had to have a way of protecting themselves from marauders who wanted to steal their hoarded goods. It was a totally crazy time. Truck drivers talked about it all the time. That was the topic of conversation when a group of men were gathered together. There were people that didn’t believe it would happen and life would go on just like any other day. There were people that were positive they would be stuck out in the middle of nowhere, far from the safety of their family. Computer programers were working themselves to a frazzle figuring out a way to write code that would be implemented for the banks, corporations, and governmental agencies to continue on. I don’t really know what all the panic was about except to say that ALL of the computer’s date feature did not go past December 31, 1999. Whomever created the coding for the first computers in the early days picked an arbitrary date and left it. No one had thought to change the code over the years until they were faced with this calamity. Joe and I had delivered trucks in California somewhere and were on our way home in the pickup. We stopped for the night in Albuquerque, New Mexico and stayed at the Best Western on December 31, 1999. We talked about the real possibility we would not be able to buy gasoline to get home. Any money we had waiting in our mailbox or already in the bank may just be worthless paper. We went to bed with our own thoughts on what we were going to face come morning. I don’t know about Joe but I do remember having a fitful nights sleep. I think I was awake most of the night. Any noise out in the hallway of the hotel made me suspect the door would be forced open and some crazed person would rush in and commit all manner of mayhem. The alarm feature of my wrist watch went off at 5:30 a.m. I sat up in bed and, tentatively, turned the switch of the night table lamp. I remember being afraid to do it, turn the light on. What if? If the light doesn’t come on does that mean everything was true? What if the light does come on? Does that mean the general public had been lead to crazy town all year long? Well, I had to find out. I turned the switch and the light came on. Yes! The power grid had not failed in Albuquerque, New Mexico anyway. Next thing to do was check Joe’s cell phone to see if there was a signal. His phone was fine and working properly. Next item of business was to call our bank’s 800 number and see if I could get through and find out if we still had money to get home. The irritating recorded message at the bank with all the commands to push that number and then this number, enter this information and that information, were like music to my ear as I listened. With an excited yelp I told Joe that we still had access to our bank account and could get home. New Year’s Day, January 1, 2000, in Albuquerque, New Mexico dawned windy and cold. There were voices heard on our floor and down the hallway. Excited voices. Happy voices. Laughter and calls out saying they knew everything would be just fine. The staff at the hotel front desk were happy and laughing at each other for being so scared of what could have been. The restaurant staff at the hotel were glad to see us and were happy to be of service to us. The pall of gloom and doom that had infected everyone for nearly the entire year had been lifted. Now the jokes came out. “What are you going to do with the cases of canned tuna you bought?” Truck drivers chided each other over the amount of bottled water they had stored in their trucks. There were a few that said they could have free showers now. Just use the bottles of water they had stockpiled. 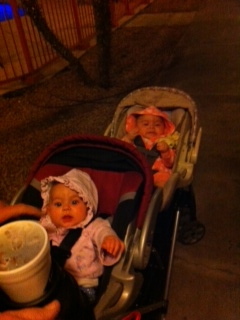 The people we encountered on our journey home made me thankful that everything worked out well. People came together to work out a problem to make sure our lives could go on just as normal. They poked fun at themselves for having been so scared and panicked – over NOTHING. What are your memories about the turn of the new century? Where were you? Did you stockpile canned goods and water? Were you one of the many who bought a generator to power your home and keep your refrigerator working? Stay tuned. You never know what will come out on this blog. 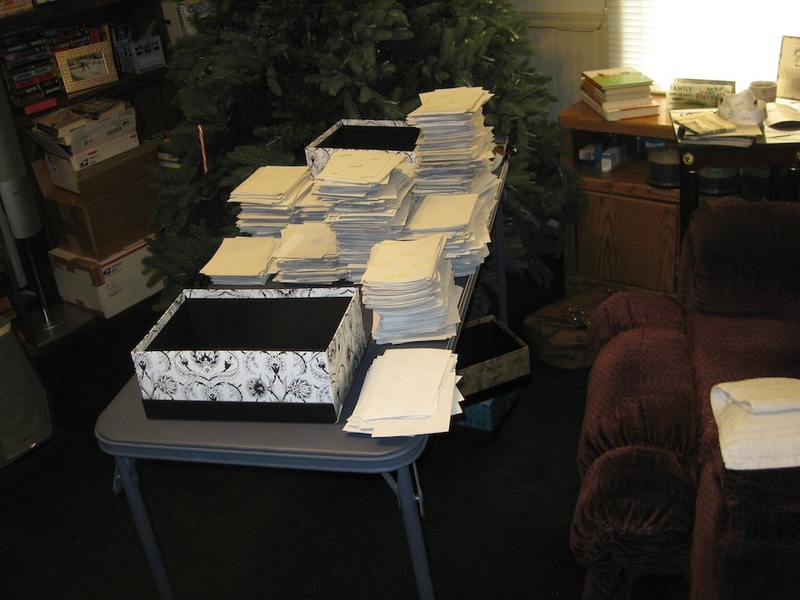 I have boxes of photos I’ve gone through and put in year order. 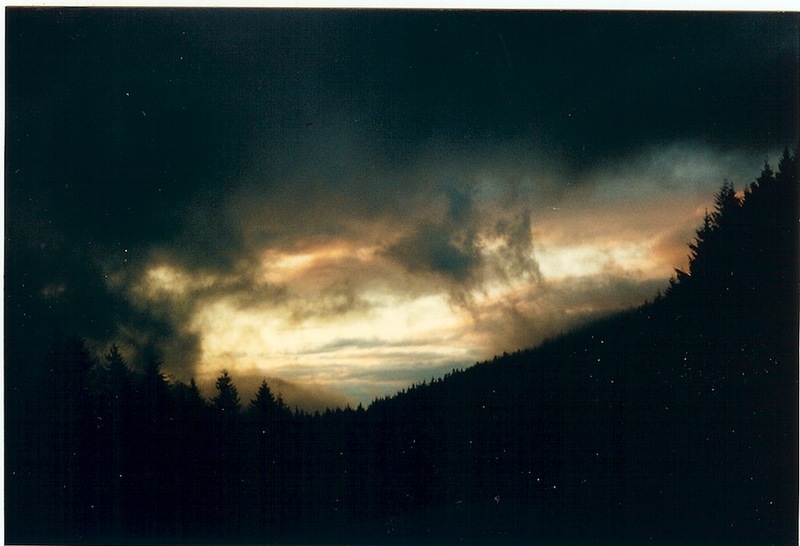 Looking through the photos brought back tons of memories and I will be sharing them with you. Joe picked up trucks in Fontana, California bound for Georgia. He made a stop in Arizona to see family there. 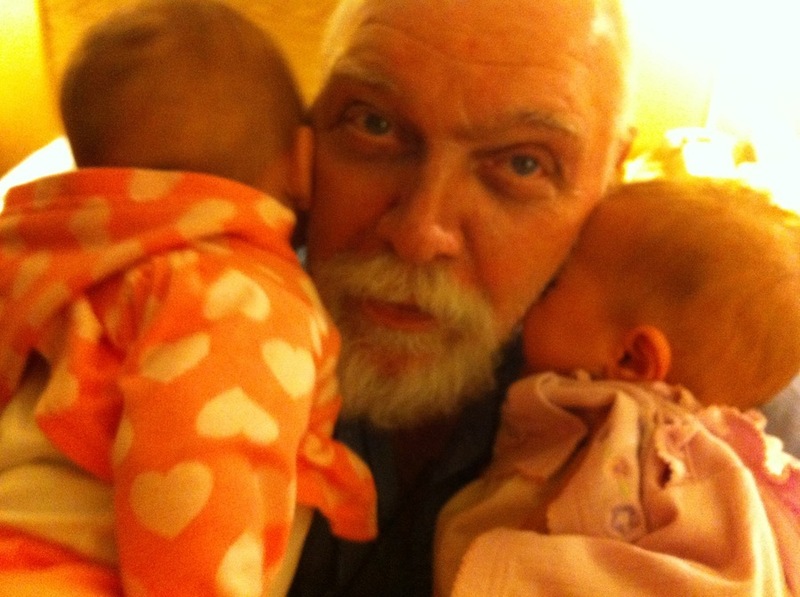 He got to love on our grand-daughters as well as their Mom and Dad. I sincerely hope that everyone enjoyed their Thanksgiving day spent with family and friends. A Honeymoon – of sorts. Riding along in Drive-Away Transport. I rode with Joe for about 2 years before I started driving. Joe had been out on the road by himself with the Gravity Boom for several months while I stayed at home. We had been married for a little over 9 years at this time. When I’m left to my own devices I spend a lot of time in introspection and learning about who and what I am as a person. Uhm….sometimes the journey into self awareness took me down some peculiar paths. At that time I learned of the concept of a Gratitude Journal. Having no one to guide me and give me direction, except the book itself, I worked at getting my depressed self up off the floor and into clothes other than pajamas. My only company, while alone at home, was a cat and a dog. They were of no substantial help in my self awareness journey. I mean, neither one of them told me that it was high time to get the stink off and go take a shower and get dressed. Neither one of them told me that I needed to get something to eat. Poor Joe. He would call me during the day and tell me about his adventures out on the road. Trucks breaking down, or a flat tire that left him sitting on the highway shoulder for 3 or more hours waiting for a service truck to arrive. He would tell me about the price of fuel and how much he felt we were being gouged by Big Oil. Let me remind you…..diesel fuel at that time was $2.75 a gallon. Oh, to have those prices back again! He would ask me about my day and what was happening. I think it was his attempt to nudge me into doing something. Well, let me tell you. I had my husband wondering if I had gone off the deep end a few times. He would call one day – several times mind you. About the 7th time he called I would be ready to chew his head off, and I did do exactly that on some days. So you can probably imagine his confusion when one day he calls me about the 5th time, Gritting his teeth and getting ready for a pretty hostile response from me. What he got, instead, was a non stop blab fest of how much I loved him and I was very grateful he was in my life. Frankly, there were a few times I had to ask if he were still on the line – he was dumbfounded into speechlessness. I learned about Iyanla Vanzant during that time. Her book – One Day My Soul Just Opened Up – helped me to look at my life differently. This book and the Gratitude Journal kept me from going off the deep end. Literally. All the time I was alone gave me way too much time to think about the wreck I had made of our early married life with his kids and mine. It was time to get this wreck cleaned up and there was no one but me to do it. When Joe came home for Christmas of 1999 I asked if I could go along with him the beginning of 2000. “I can help you get hooked up and deliver the trucks.” Joe was happy to have me come along with him. The first several months on the road with him were like going on a Honeymoon. He was taking me to far flung places. We enjoyed each others company. He taught me the physically demanding work of getting the trucks ready for transport or delivery. 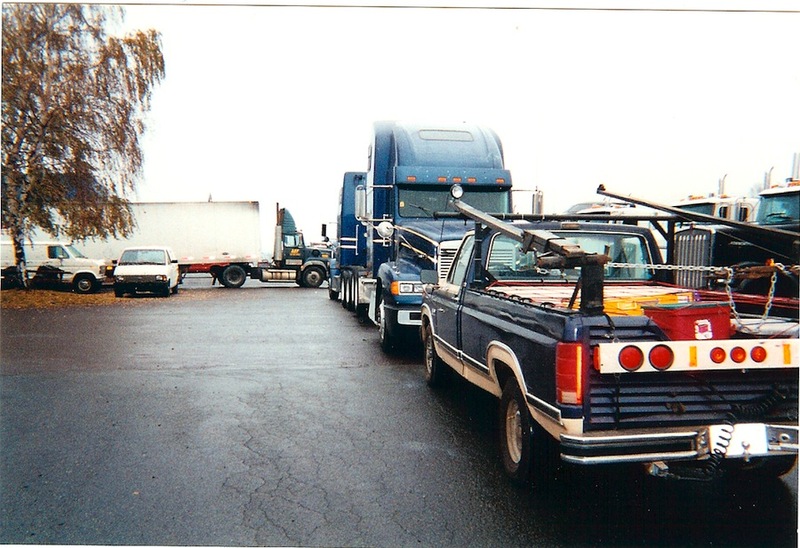 We slept in the trucks each night and in hotels during the deadhead between moves. He took me to odd little truck stops or restaurants. Bought me little gifts along the way. Our cat had disappeared the previous Halloween and she never came back home. Poor Wendy. I never found her again. Our dog, Princess, came with us. I saw odd structures that were not quite barns. I would later learn they were tobacco barns. I saw trees everywhere along the interstate. Our poor dog found happiness wherever she could, even it was watching the outside world through a window. I took photos of nearly everything I could see. It was a crazy time and I was a crazy woman with a camera. I looked out the mirror to see our pickup bringing up the rear in our travels. Cactus thriving under a blanket of snow in Selma, North Carolina. My appreciation of barns and farm structures began in those first few months. Gracie bringing up the rear, cactus in the snow, barn structures in fields. The rock walls of Virginia were fascinating to me. Seeing trees growing out of that hard granite rock and some intrepid souls had painted their mark on the rock face. For the most part I enjoyed my time with Joe on the road. I traveled with him “illegally” because Coldiron Companies had a “No Rider” policy so I had to keep a low profile so he would not be fired from the job. I wasn’t hiding very well. Most of the dispatchers knew I was along with Joe. Having the dog along was a pleasure and a trial. Waiting for her to find just the right spot to poop made me crazy. Especially on the days the biting cold winter winds made me feel like my bones were going to freeze. Being squished against the cold rear wall of the sleeper bunk at night was not much fun either but we were all together. Stick with me. I’m just laying the ground work of the advent of Joe’s trailer. It was during these months that Joe was working out the details in his head. He knew there had to be a better way of moving these trucks with the pickup between them instead of following behind all the time. There were a lot of expenses involved in having our “chase vehicle” being pulled along behind. Tires, drivelines, axles catching fire, engine problems, and all kinds of other fun things that happened to leave us stranded at the side of the road. If you think that this time on the road with Joe was all romance, I’m going to burst your bubble. Just think about the long road trips you have been on. Either as a child with your family or as an adult taking the trips with your family. Now just consider the fun and frustration you had for one or two weeks. Joe and I had that for over 45 weeks a year. There were many days that I was a very ungrateful person. Hello there. I have been neglecting this blog for long enough. Time to make amends and get reacquainted with you all. My truck driving days are over. I went out the first of this month (November 2014) and it was a total disaster. My body and kidneys rebelled against this idea. In trying to figure out what I would do to contribute to this blog, without totally abandoning it altogether, I have given Joe the task of taking photos of the trucks he’s now moving by himself. So, while I await him following instructions I will fill the time with telling you the “history” of the trailer Joe uses in his work. Way, way back. March 1999 to be exact. Joe designed and built a “Gravity Boom”. 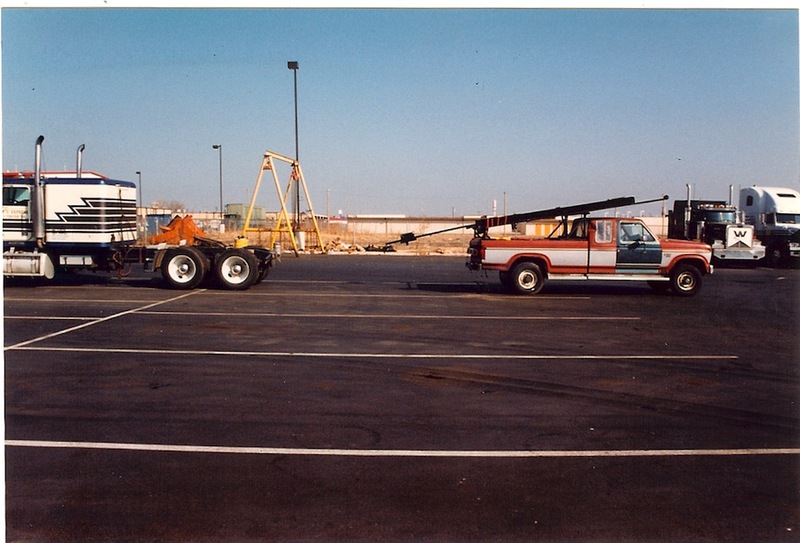 This boom was carried on special ramps and rigging on the back of our old red pickup truck. At that time the pickup was already over 12 years old. 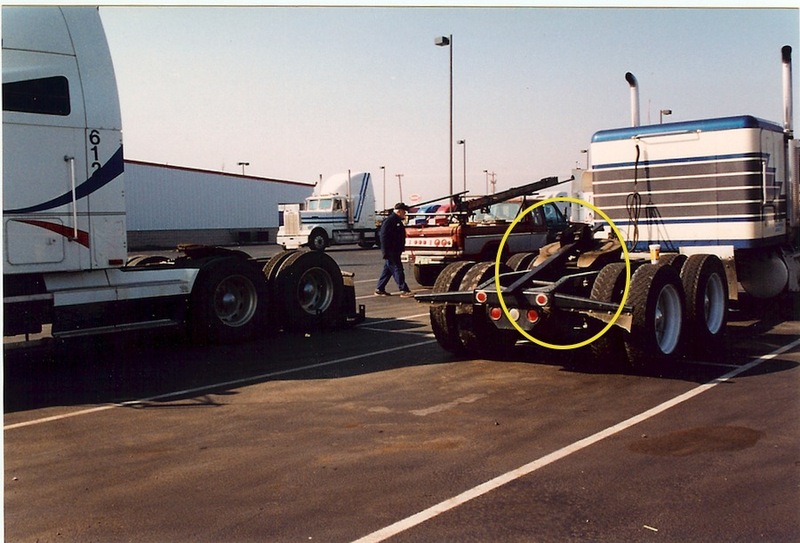 The “Stinger” piece rode on the left side of the pickup bed on a ramp all its own. Joe engineered these two pieces to roll down their ramps for ease of installation and removal. This Gravity Boom, and the support structure, weighs well over 1,000 pounds. The “Stinger” is the first to come off the racks. 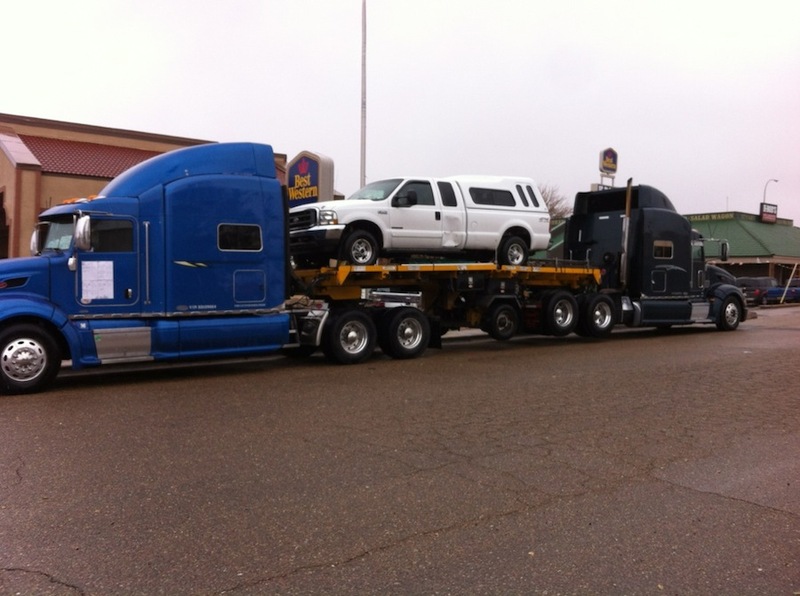 It is mounted to the 5th wheel of the truck to be towed. Once the Stinger is released from the track and free of the pickup, the guide bar is centered on the rear frame member. The pickup is then moved to the back of the truck that will be driven and the Gravity Boom will be attached to that truck’s 5th wheel. 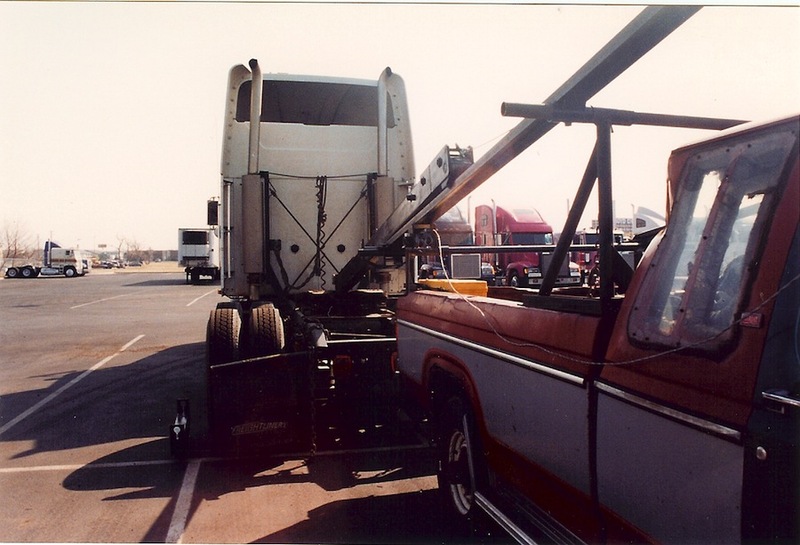 With the aid of a hand cranked winch system, the boom is lowered to the rear frame member of the truck as the pickup is driven slowly forward. 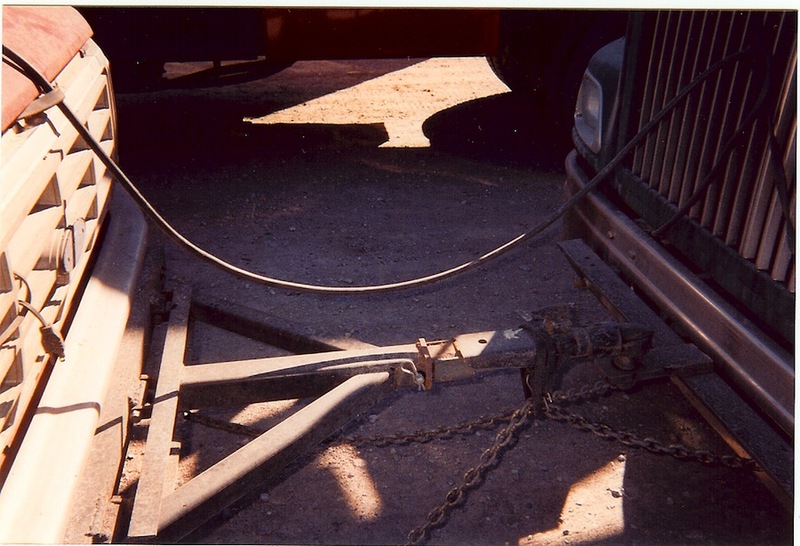 The winch keeps the boom from slamming down on the truck’s frame and damaging it. It also keeps the pickup from being shot forward or damaged as the boom could squirt it out like a watermelon seed. The winch also keeps the heavy piece of steel from being a lethal weapon before it is stubbed into the 5th wheel and secured. Yes, it has happened and it is one terrifying sight to behold. Getting that monster piece of steel off the ground and where it needs to be entails a forklift to do the work that mere mortals are not able to do. Getting the two trucks connected was fairly simple. The truck Joe would drive would be backed up to the towed truck. A bottle jack would be holding the boom up off the rear frame member. 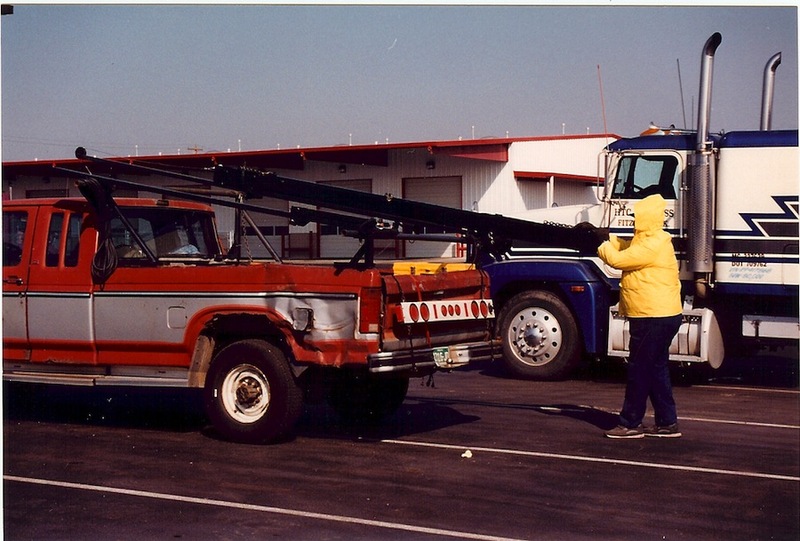 Once the trucks were positioned correctly the jack would be lowered and the boom would rest on the stinger. Backing up the front truck and locking the two pieces together would raise the rear tires of the back truck off the ground. Delivering the trucks was easy. 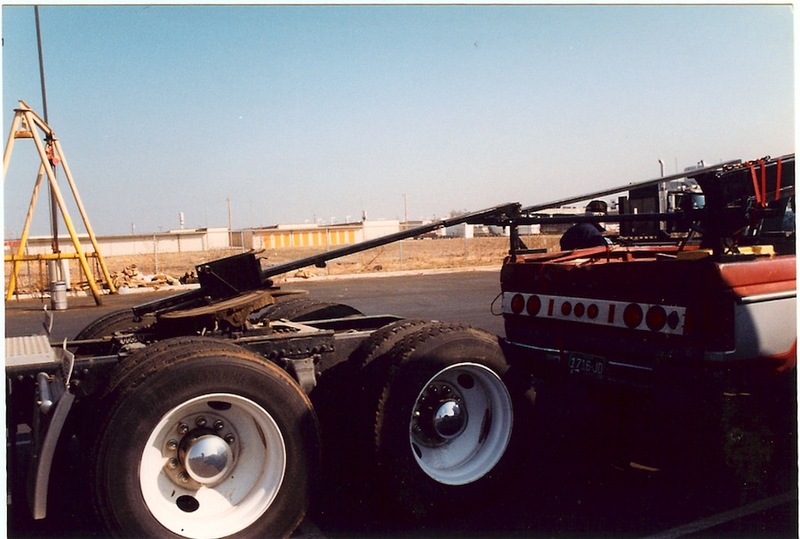 Once Joe was in the designated area to unload he removed a holding steel pin from the boom, then back in the driving truck he would back up then slam on the brakes. The back truck would be released to run willy nilly until the rear wheels met the ground. The rear brakes kept the truck from going further than about 10 feet. The Gravity Boom would slide apart and the truck would be on the ground and in a position to get the boom pieces back on their racks on the pickup. Joe has a story to tell about some well meaning person had disengaged the rear axle air brakes by pushing in the knob. When Joe delivered to a brand new dealership – his two trucks were the very first vehicles on the whole entire lot. When the rear truck was shoved free of the Gravity Boom that truck just kept right on going. Heading directly to the fancy new dealership building. It, safely, came to rest just about six feet from the front door of the building. You want to talk about terror – that was a day Joe will remember for many, many years. Personally, without any bias, I think Joe is amazing. His engineering skills are astounding, and the products he makes last longer than any of our vehicles do. The pickup was then attached to the front of the back truck and was drug around by the nose all across this country. 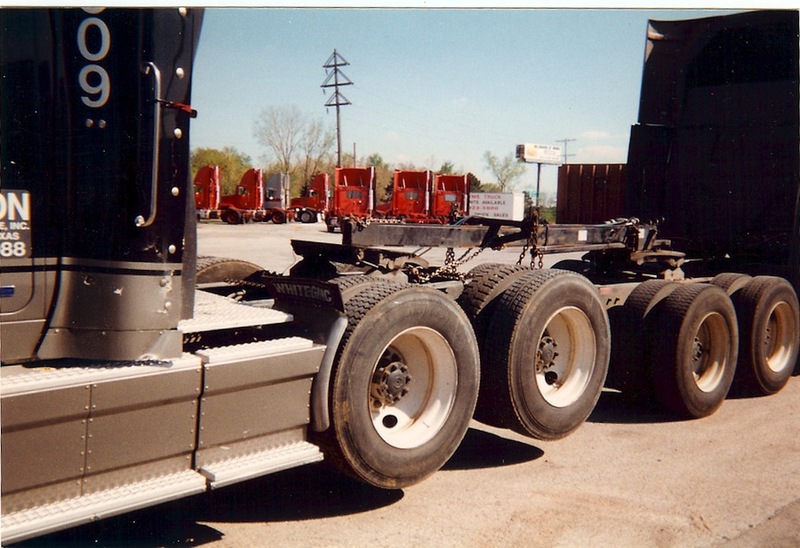 Joe designed and built several different hitches for all the different trucks he would be moving. None of them were the same. Different truck, different hitch system. He had one for Peterbilts, Kenworths, Macks, Freightliners, and Volvos. The steel pieces for the hitches went with him everywhere and were stored in the bed of the pickup. Sometime in May of 1999 this poor old red truck suffered the indignity of a blown engine. That truck had two previous engine replacements throughout the years that Joe had it. He worked that truck pretty hard and it did everything it could to keep up with him. Sadly, that old truck was replaced with a newer model. The newer truck was only “New” to Joe. This pickup truck already had close to 10 years on it. A 1989 Ford F-150. I’m not sure what the year and model is of the old red truck. For several years we traveled the country with “Gracie” and the Gravity Boom. I can’t even hazard a guess at how many trucks were moved during those years. It is feasible that Joe and Gracie put in 1,000,000 miles together. Gracie was willful at times. She came loose from her hitch a couple times while Joe was driving on one road or another. She got loose on I-35 north of Oklahoma City, Oklahoma and nearly killed him. Joe nearly had a heart attack as he watched that rebellious girl come free and do some sight seeing on her own. Gracie wound up in the median ditch, thankfully nothing and no one was harmed in that fiasco. Poor Joe, he was at the breaking point with that willful old girl. It would be another couple of years – 2002 to be exact – before the very first RapidHook Trailer would be built. I’ll save that story for another blog post. p.s. Joe is delivering a couple of “problem children” to Las Alamitos, California. They were purchased at auction. 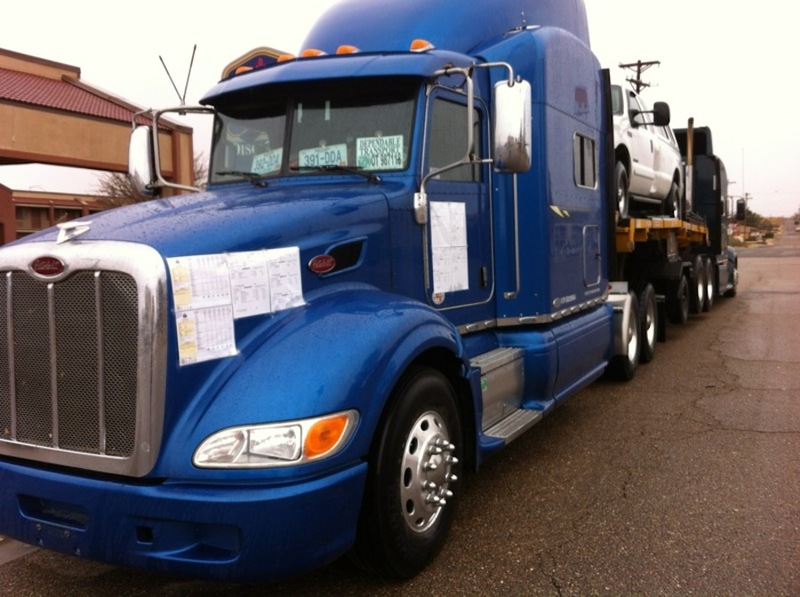 One truck is festooned with documents of repair and service work done on it. He will deliver these trucks later this afternoon.